Rob Anderlik I’d like to pose a few questions to the more experienced players here, players with at least 10 years of experience and/or players who have owned or played a wide variety of different resonator guitars. 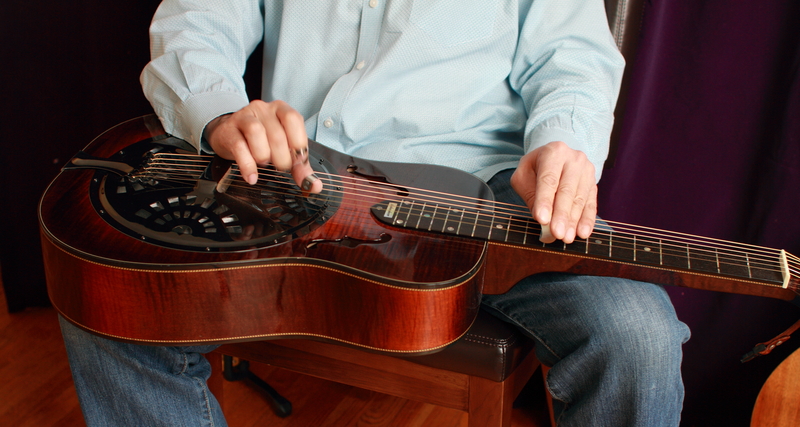 1) What are the key qualities that you look for in a squareneck resonator guitar? 2) How important is a guitar to getting your sound? Is a particular guitar essential to your sound or is it more of a matter of your preference? If so, what are those preferences? 3) What are the key differences between an entry model resonator guitar and a professional grade guitar? 4) What advice would you give to someone who is looking to move up from an entry level resonator guitar to a professional grade instrument? Howard Parker Generally speaking, I have a sound in my head. Depending on guitar it is more/less difficult for me to achieve that sound. My preferences have changed over time so, I’ve chosen those guitars that have enabled me to play what I “hear”. Greg Tucker-Kellogg I’m a bit of a a gear nerd. I’ve played many, many squareneck guitars, currently own four, and have owned and sold three others. In my view playability and sound are kind of separate dimensions for squareneck guitars. For example, a relatively small investment can improve an entry level resonator guitar, but improves playability a lot more than sound. These are the standard recommendations: quality nut and saddle, good spider bridge and cone, all properly set up. Everyone agrees this improves tone, but string spacing is usually a bit wider (and more consistent) on professional grade instruments, The bridge saddle is more solid too, so the whole thing just suddenly becomes more playable. I bet most people would sound better on entry level instruments if they replaced the bridge saddle and nut, even if they left the spider and cone alone, because of improved playability. Most entry level instruments use a soundwell design; most professional grade instruments don’t. Removing the soundwell has a huge impact in sound; IMO entirely for the better. The innovations that are possible after the soundwell has been removed add a lot of individuality to the sound, and make it worth trying different instruments. My advice to someone interested in moving up would be first to make their instrument as playable as possible, with the string spacing and basic fittings of a professional grade instrument. Then get used to that, so when trying a better instrument they aren’t seduced by the change in basic parameters. Finally, go to a convention, like IBMA or NAMM, where there are a lot of instruments to try. Squareneck guitars aren’t like roundneck guitars; you may need to make a trip, since the mountain won’t come to Moses. Alan Minietta I have owned a number of squarenecks both high end and low.I’ve also played many from a boutique build by a local luthier to a budget model with a very good set up and I try to road test others if I run across them.To me it all comes down to the set up.I recently bought a low end model for a practice guitar for out of town trips.I really like the string spacing which is critical for me,the sound well was very similar in construction to a higher end instrument I have.The cone is top notch and very good quality hardware.Since it was used and in excellent condition with a hard case it was so inexpensive that I couldn’t pass it up.I took a set up workshop years ago and just the right amount of adjustments,a good quality cone and good parts can make a big difference. BTW my only complaint with the budget reso is that the string height is a bit low for my taste and my fingerpicks hit the top of the coverplate more often that with my other 2 resos at home. Bill Arnold I like what Howard said. Basically any guitar that helps you find the sound you hear in your head. Specifically, I like a quick response and there’s a certain “sparkle” I need to hear. I also like a guitar that moves when I play it. Some guitars push sound from the wood and some PULL from it. I like guitars (not exclusive to square necks……or resonators for that matter) that have the “whole body experience”. Hard to put in words. It’s something that punches into your chest from a good flat top, or resonates into your arms and lap from a great square neck. I dunno…..everybody’s different like every guitar’s different. Greg Booth I like a dobro that I don’t have to work hard to be heard or get decent tone. With some exceptions such as Jerry on his pre-wars, the harder you play beyond a certain point the tone suffers IMO. Mike got his sweet tone playing light and cleanly. For me and my style I love the modern powerful guitars. When you dig in they always have more. I like sparkle without being tinny or harsh, and I like the fullness of the modern sound. Without naming guitars there is one that stands out for me but there are many others that fit this category as well. Everybody’s hands, touch and style are a little different so there is no one size fits all here. What sounds great on somebody’s lap won’t sound the same on another so it’s important to try them all and then spend ample time playing and adjusting to what brings out your sound on that guitar. Mike Elliott Sound is an important quality I look for in a guitar. Too much of a peticular frequency can hinder what you are trying to do musically. The guitar I play and endorse has a great bass but the high end does not overpower. I recently got a guitar that does not have the deep bass but it has an “old” sound like a guitar built in the 30’s which I use when playing Flatt and Scruggs oriented material. You have to try reso guitars to know if they are right for you.The action( string width and heighth) across the neck is a factor. If your strings are too close, you can’t play fast and clean. A guitar has to “fit ” you, so to speak on a variety of levels . I have played guitars that were great sounding but I could’t play them on a regular basis because they didn’t feel right to me.Some body else may play the same reso and it fits them perfect in every aspect.A guitar custom made for you will fit you and will grow with you as you progress and grow musically. Howard Parker Comparing preferences is like asking someone to describe the color “red”. Bill Arnold – Spot on!! Orville Johnson Agreed. You can’t tell anything from listening to sound clips thru crappy computer speakers recorded with questionable/unknown mikes and mike positioning. You have to play the guitar to get an idea about it. That said, when I had Ivan Guernsey make me a guitar my instructions to him were, “Make it sound exactly like Mike Auldridge’s number one guitar!”. Mike was playing Guernseys at that time and I had played his main guitar (Thanks, Mike! ), so I had a good idea of how it might end up sounding. Mark Clifton Agree to all that. When we sit and play a guitar either it feels good or it doesn’t. We all know when we play that one “comfortable” guitar that works for us. Feels good right away. Feels good in our hands and makes it a pleasure to play. Each to his own sound. Sally Van Meter Bottom line for me is a guitar that will play what I hear in my head. Off the top, the first string tone is critical,and has to have strong round tone beyond the 5th fret, another thing is that the strings don’t stop ringing beyond the 5th fret. I want a guitar to give me everything it can, to have been built well enough to possess that quality. I really don’t want to have to work hard for sustain. I don’t really care who the builder is as long as that sustain and warmth is always present, whether it is on the 2nd fret or the 17th fret. The final thing for me is to be able to find the perfect balance of tones across all the strings. That helps me with clarity issues. I do believe as well that a good player can make an inexpensive reso sound pretty good just by the nature of their own tone production. I play lots of different sounds for different folks, so sometimes a solid mahogany will give me what I want for that particular session, and sometimes an all maple will give me a little edge. Sometimes it is a spruce and Indian redwood or other times, I am looking for the kind of sound an all walnut will produce. The one reso that I think is the toughest for me to produce the sound my head/heart hears is a guitar that is all Koa. On a Weissenborn it sounds great. On a reso, for my ears it always feels too bright and lacks a depth that my head wants to hear. It really does depend on the player and their own feel for tone and responsiveness from a reso. I agree with Rob that one size does not fit all and he gives solid advice to try out as many as possible before you settle on one that feels so right in your hands. Rob Anderlik Sally, thanks so much for posting this! I don’t think I’ve ever seen a better description of what it means for a squareneck guitar to have great playability and responsiveness. More often than not, when I play a guitar for the first time I have an intuitive sense of whether I like it or not, but I’m not always able to articulate the reasons why. The insights shared in your post above are a great addition to this discussion. Thanks! Sally Van Meter I liked how you posed the question, and especially that you said not too mention builders, Keeps the discussion more to the point, and no competitiveness to it. I like that. Glad to have been a part of it! To those not familiar with the artists posting on this subject, I would offer this advice: Take this information from this article and use it as a guide in your everyday playing. You will save yourself many hours of agonizing what the sound is that you are looking for. After six decades of playing I find that nothing could further from the truth. Many thanks to Rob for doing this !